Teapigs is one of my favourite tea brands, I have a haul post on my blog already from Teapigs including their gorgeous glass teacup and their tea pick 'n' mix. I also LOVE their matcha green tea drinks which I received on my beauty and lifestyle blog. I was recently sent the *Teapigs Rooibos Creme Caramel, *Teapigs Rooibos and *Teapigs Spiced Winter Red Caffeine Free Teas (£3.99, 15 biodegradable 'tea temples'). I have tried the Spiced Winter Red Tea back in February and I described it in my post as 'heaven in a teacup' but I haven't tried the Rooibos (red bush) tea before. Apart from the Spiced Winter Red tea, I haven't tried any other red bush tea until now. 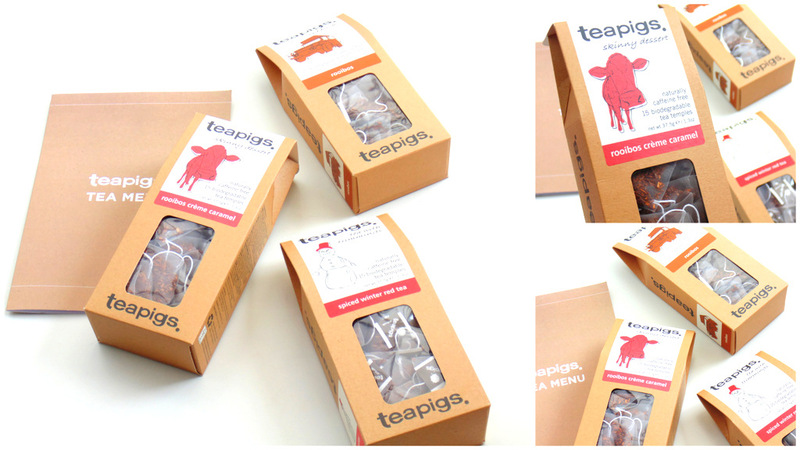 *Teapigs Spiced Winter Red Tea is a blend of orange peel, cinnamon, clove and red bush tea. I just love the smell of this tea, it's so warming and christmasy to me! I always use my glass teacup from Teapigs, it looks quite fancy especially as you can see the tea infusing. This tea is definitely my favourite from the three although I didn't expect it to be such a close contest. The main flavour of this tea, to me, is cinnamon and it is sweeter than you might expect. I'd definitely buy this again but just for the colder months. Overall rating: ★★★★★, 5/5. *Teapigs Rooibos Tea is a blend of honey and red bush tea. This blend smells quite strong but the flavour is actually fairly subtle, mild and very pleasant. I didn't know if I would like it but it's so nice, earthy and slightly smokey to me although I'm sure there is a much better way of describing it! Overall rating: ★★★★★, 5/5. *Teapigs Rooibos Creme Caramel Tea is a blend of red tea (which is naturally caffeine free and contains flavonoids which makes it as hydrating as water) as well as caramel pieces which is a little unusual but it smells more like earthy rich toffee to me. Again as with the previous tea, I thought this one would be really strong and also quite sweet because of the caramel but I was very pleasantly surprised. The flavour is quite subtle, earthy, toffee like and sweet to an extent but not as sickly sweet as I thought it would be. As stated on the box, it is very dessert like! Overall rating: ★★★★☆, 4/5. Overall, I'm very pleasantly surprised at just how much I like all three teas - I knew I loved the first Spiced Winter Red Tea but I love both the Rooibos and Rooibos Creme Caramel teas too. All three are not like 'normal' tea, they are much more subtle and very earthy in comparison, in my opinion. I would definitely buy the Spiced Winter Red tea along with the Rooibos (Rooibos and Honey) tea in the future! Have you tried any tea infusions from Teapigs? I didn't try any tea from Teapigs, but I'd love to. I adore tea! I love drinking tea,many times in the day! Is it bad to say I haven't tried Teapigs but wanted to because I liked the packaging so much? I love the sound of Teapigs Spiced Winter Red Tea. We love Christmas and this sounds like a nice (booze free) festive drink. I have never been drawn to the caffeine-free or alcohol-free type drinks. I'd rather just drink something else if I didn't want caffeine or alcohol!